The college offers an array of pre-college enrichment programs for elementary, middle and high school students. Engineers on Wheels is a specially-outfitted high-tech van bringing engineering activity kits on rolling carts into the public schools. 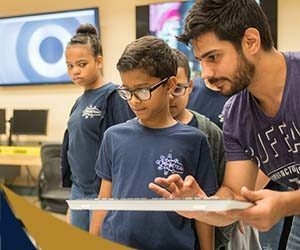 The program features grade-appropriate, interactive lessons and presentations, as well as hand-on activities and experiments led by FIU students and overseen by FIU faculty. Subjects will include mechanical and materials engineering, computer science and information technology, biomedical engineering, civil and environmental engineering, construction and engineering management, and electrical and computer engineering. The FIU Engineering Expo is the college’s premier community outreach event organized annually and welcoming more than 1,400 K-12 students from Miami Dade and Broward County Schools (elementary, middle and high schools) to the FIU Engineering Center to engage FIU students, researchers and staff, and to discover the endless possibilities of STEM. Florida International University (FIU) and select elementary schools in the West Dade area are working in partnership with The Children’s Trust to provide after school and summer programs for elementary, middle, and high school students and K-Parent informational meetings at FIU. The event is hosted by FIU Center for Diversity and Student Success in Engineering and Computing (CD-SSEC) and the ASCE student chapter. Over 200 students, teachers, parents, abuelas and abuelos assembled on Saturday November 4th to learn how to build a bridge for the SECME Bridge Competition. Also FPL hosted a generator seminar where students build a generator in the classroom. A summer STEM-focused academic enrichment and recreational program for students aspiring and preparing to attend college. The college offers several dual enrollment courses to high school students. These courses are free to students and provide an opportunity for students to earn high school and college credit simultaneously (grades will become part of permanent high school AND college transcripts).